The book "Through the Eyes of a 12-Year-old Girl" by my Mother, Janina Hesheles Altman, has been translated to many languages. A short film is available, documenting aw movie and a theater show on the book. Her most recent book on the Weisse Rose (German resistence movement of students and professors in Munich University) is availablle in hebrew and in German, see "Naturwissenschaftler vor und nach Hitlers Aufstieg zur Macht". 1 2 3 4 5 6 7 8 more. Dec 2017: The Distinguished Technical Achievement Recognition Award awarded by IEEE TC on Big Data conference (TCBD), for « his outstanding technical leadership and achievement in stochastic modeling and big data analysis». 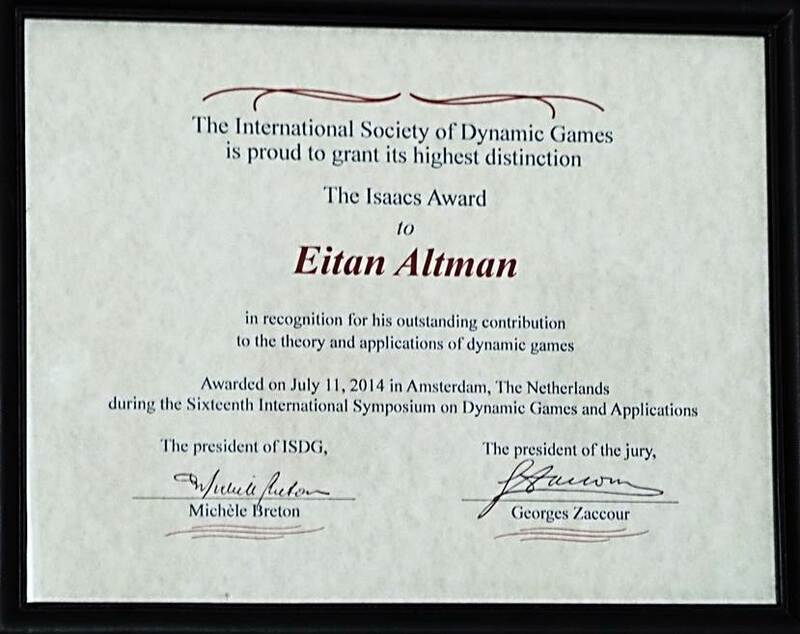 July 11, 2014: The society of dynamic games attributes the Isaacs Award to Eitan in recognition of his research on game theory. The ceremony took place at the ISDG international symposium on 9-12 July. Oct 16th, 2012: the French Academy of Sciences attributes the Grand Prix France Telecom jointly to Joel CIBERT and to Eitan ALTMAN, see video (to the left) and photos.